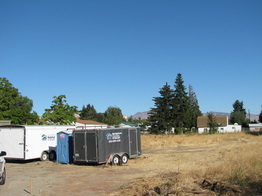 Lots are cleared and surveyed for placement of the home. Excavation and ground work begins to lay the foundation and prepare for the construction of the house. the progress of each project and make plans for the upcoming phases. The building committee consists of a Chairperson, our Site Supervisor, our Executive Director, a Family Mentor and our Volunteer Coordinator. Habitat for Humanity homes are simple, decent, affordable homes built with purchased materials and volunteer labor to provide for the lowest possible cost with ease of construction. Homes are designed to accomodate the size of the family occupying them. Most of the home built are three bedroom homes with 1,170 sq ft. Completed homes are sold to qualifying families for our cost with a no-interest 20 to 25 year mortgage. so please contact us if you would like to get involved! VIEW OUR CONSTRUCTION SLIDESHOW OF A HOUSE FROM BEGINNING TO END - WHY NOT JOIN US!